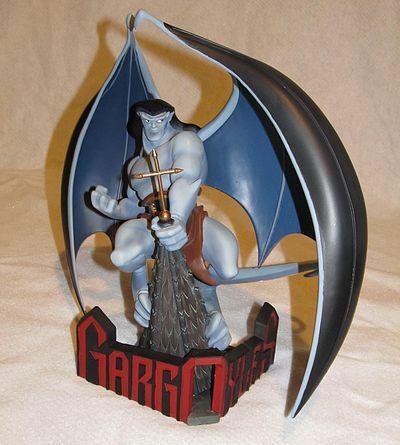 Bryon Stump steps up with a guest review of one of the cool Electric Tiki Disney Classics statues - tell us all about it, Bryon! 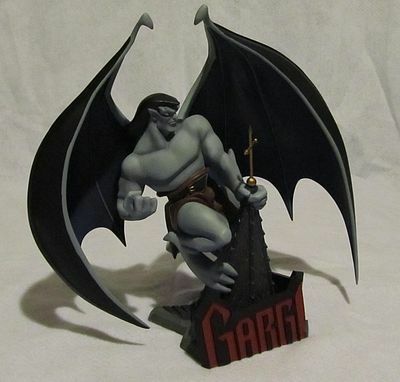 Gargoyles! One of the best shows to come out of Disney in the 90s. Intelligently written and boasting a remarkable voice cast. It is something of a tragedy that Disney has not seen fit to release all of this classic series on DVD. The toy line that followed the series was not particularly inspiring. None of the action figures released were accurate representations of the characters. 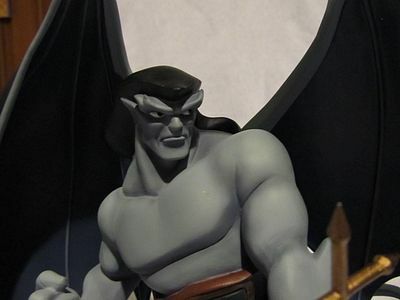 The Applause figurines were better, but still… Electric Tiki, as apart of their “Classic Heroes” line has recently released a limited edition statue of gargoyle clan leader, Goliath. The packaging is sturdy and features large, colorful pictures of the assembled statue. There is fun piece of text promoting the item written by Greg Weisman the show’s main writer and producer. I’m not sure the Styrofoam packing was as well designed as it could have been. My statue suffered a small bit of damage which I will elaborate on later in this review. Oh yeah! This is what Goliath looked like on the show! All the details are sharp and show accurate. The lines are smooth and simple, but totally in line with the animation style of the show. His pose is dynamic, yet it works to give an impression of the character in action while still giving you an excellent overall view. I find that many animation maquettes are perfect renditions of the characters they portray, but always seem to look stiff, static, and lifeless. This statue manages to find a nice balance between giving an accurate reproduction and a nice sense of motion. I have also seen the new Goliath statue coming from Bowen Designs. I much prefer this rendition. The Bowen statue is quite striking and full of action, but it is far too stylized for my tastes. It simply doesn’t represent the character as he appeared on the show. This statue does that extremely well. This is another area in which this item excels. The paint lines are clean and crisp. There is little to no bleed between colors. The color choices reflect the dark nature of the show. 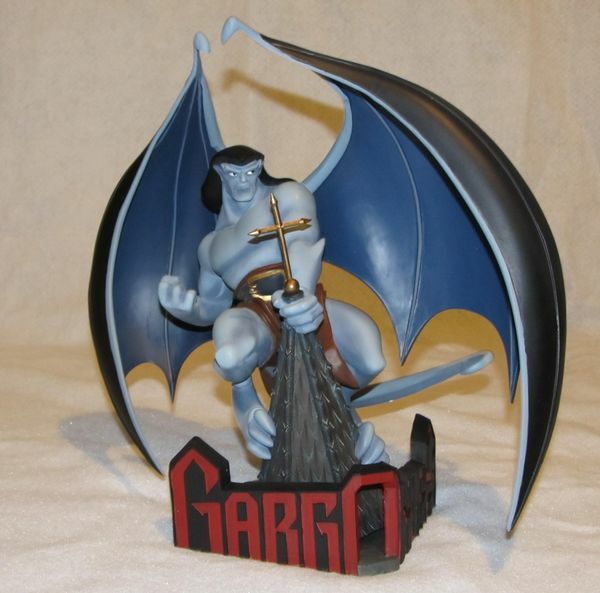 It should also be noted that a significant amount of airbrush work has been done on the statue to intensify shadows and to add definition to the physique of the gargoyle. This all adds to the impression that we are looking at a figure at night, even in a bright lighting. This is a large, heavy statue produced in extremely small numbers (limited to 200). I suppose a $200 price tag isn’t at all unreasonable for such an item, but it kind of hard to justify spending that much for a cartoon character statue. I’ve done it before, however, and I’ll probably do it again. 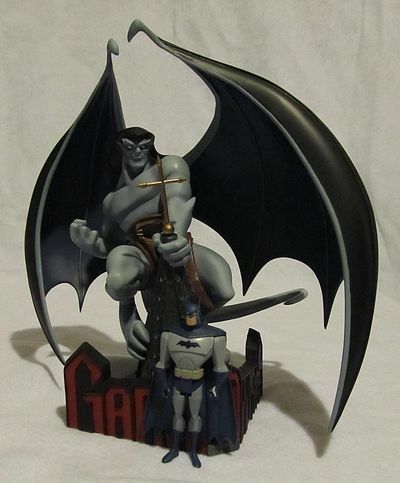 If the cartoon meant a lot to you or if you really admire a nicely done sculpture, then this piece is definitely for you. My answer was yes to both questions. If you are interested in purchasing one, I’d suggest you act quickly. 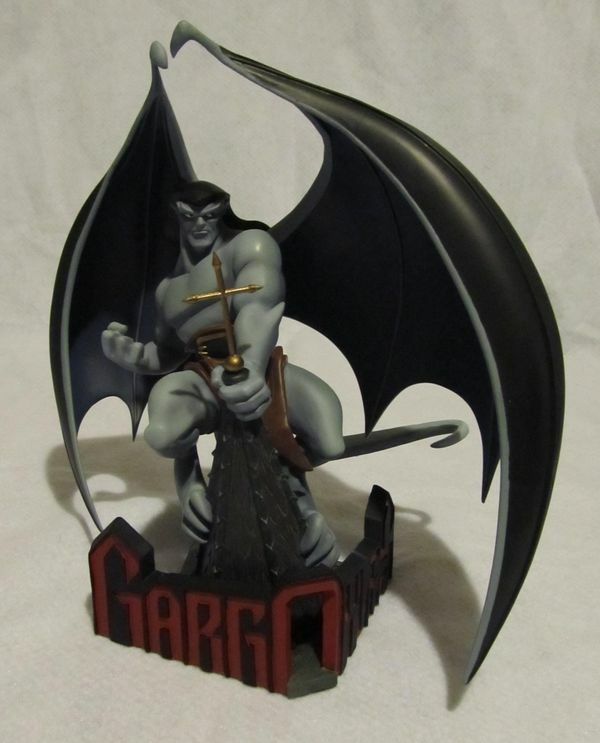 There are only 199 of them out there somewhere and there are a lot of Gargoyles fans! When I opened the packaging, I noticed that the cross from the steeple had broken off. I’m not sure if this was a packing fault or an isolated case. I got mine from Big Bad Toy Store and I’ve always found them easy to work concerning returns. I decided not to return it. Having it in hand made it very hard to part with. It was a very easy fix, one drop of glue. Yeah, I sure it’s value has been drastically reduced, but, since I’d be very unlikely to ever sell it, I don’t really care. Still, spending that much money for a statue, most people expect perfection. 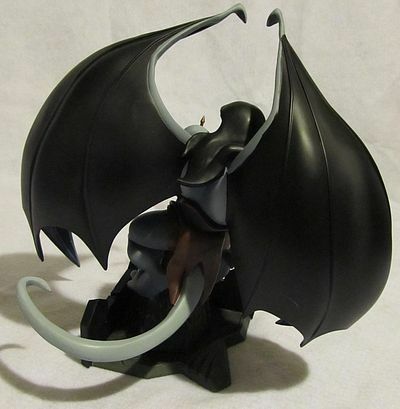 It is a fantastic representation of a classic cartoon character in a dynamic action pose. It is nicely rendered and expertly painted. It really captures the look of the character and the feel of the show. If it had been slightly cheaper, I might have given it the extra star, excluding the minor damage. I would really like to see more characters from the show get this treatment, but I don’t know how much of that my wallet could stand. Or you can try eBay! This product was purchased for the review by the reviewer. Photos and text by Bryon Stump.